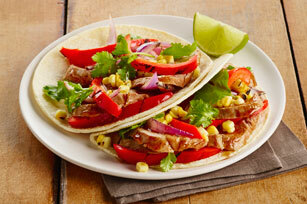 Switch up your regular taco recipe with these easy-to-make pork tacos. The dressing in this recipe provides all the flavouring you need and is filled with grilled pork and a delish onion, pepper relish. These will be the next family favourite! Remove 3 Tbsp. dressing; brush 1 Tbsp. evenly onto vegetables, and brush remaining 2 Tbsp. onto meat. Grill meat and vegetables 6 to 8 min. on each side or until meat is done (160ºF) and vegetables are tender. Cut kernels off corn cob. Cut meat, peppers and onions into thin slices. Top tortillas with meat, corn, peppers and onions; drizzle with remaining dressing. Sprinkle tacos with chopped fresh cilantro; drizzle with fresh lime juice. Add tortillas 1 at a time, to skillet; cook on medium-low heat 1 min. on each side or just until warmed. Or, stack tortillas, wrap in damp paper towels, and microwave on HIGH 1 min. or just until tortillas are warmed.